Hollywood's 3D revolution has changed the shape of the modern blockbuster and helped boost box office income for studios in an era of financial uncertainty. That's why nowadays the cinema is filled to brim with superhero 3D movies or animated 3D movies. If you are also one of the 3D movie lovers and wanna save 3D movies in HD to watch 3D on Mac or 3D TV at home, congratulations, you are staying at the right place, for this article covers all the details you need for free HD 3D movies downloads. Let's cut to the chase. The first free movies download site I wanna introduce to you is YouTube, which, needless to explain it further, provides you with a zillion 3D movie resource to free download for watching on 3D TV, regardless of 2015 Hollywood 3D movies in English, or funny 3D films full HD in Hindi-you name it. Beyond the full HD 3D movie, you can also get 3D movies download free, 3D Blu Ray movies/trailers in 720P 1080P or 4K UHD. If you want to save 3D movies free from YouTube, here the all-round MacX Video Converter Pro (or Windows Version) can assist you to make this job done with greatest ease. This 3D movies downloader for YouTube can hassle-free download 3D movies free from YouTube, no matter 3D films formatted with MP4, MKV, AVI, FLV, WebM, or in resolution 720P, 1080P, 4K Ultra HD, even Blu Ray 3D movies. It can also convert full HD 3D movies to iPhone XR/Xs/Xs Max, iPad Pro, iPad mini 4, The new Apple TV, Galaxy S9 edge+/Note 9, Sony Xperia Z5, etc. Another special feature worth a mention is that it can also download HD movies in 3D from other 3D movies download sites like Dailymotion, Myvideo, Metacafe, Myspace, cinemassacre, comedycentral, crunchyroll, etc. 1000+ movie sites with world's No.1 fast speed (Intel QSV/Nvidia/AMD supported). For those friends who pursue to download 3D cartoon movies from Disney or Marvel and 3D documentary movies, the world-famous forfree3d is the paradise for you to land on, where you can get 3D free movies download in 1080P 720P with latest animated movies, documentary movies, like Disney Planes, Frozen, Beauty & Beast, Gravity, Hubble, etc. Only one drawback might bother you. That is the downloaded full high definition 3D movies are formatted with MKV, which is incompatible with your 3D tablets, Samsung/LG 3D TV and iPhone iPad mobile device. But no biggie. The aforementioned MacX Video Converter Pro or some other free YouTube downloader for Mac/PC tool like KeepVid can help you out of this predicament. See, it works as a professional video converter to convert 3D movies to MP4, MOV, M4V, AVI, FLV, MP3, AAC, etc, as well as iPhone, iPad Pro, iPad mini 4, Samsung, Huawei, Sony, Microsft, Google Nexus, etc. with 420+ preset profiles offered. Thus, you can not only watch best 3D movies on 3D TV, but also enjoy 3D movies in English on your iPhone iPad Android anywhere at any time. 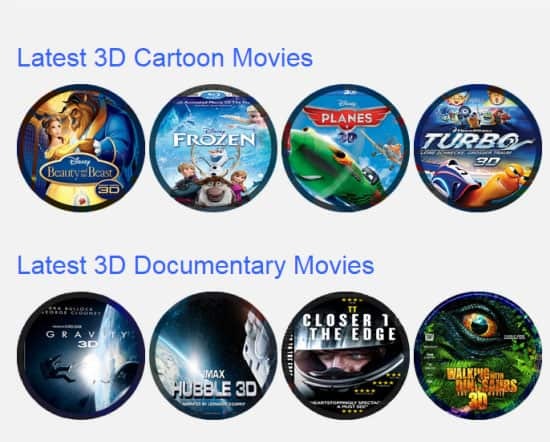 Instead of free downloading Blu-ray 3D movies full HD from online sites, there is another option for you - download 3D movies from 3D movie streaming service Yabazam. News from the eminent globenewswire that "Yabazam 3D app now available to stream 3D content on Google Play". The Yabazam 3D app is a free 3D content streaming service for Samsung and LG 3D TVs, which up to now reaches 1,000,000 3D movies downloads. Plus, it accounts for 64% of the 3D TV market in the USA, with free 3D movie trailers streaming and over 80 titles for viewing with a monthly subscription in the USA. Now, Yabazam delivers 3D high definition movies, video content for Samsung/LG 3D TVs, PCs and mobile devices. And if you own an Android 3D tablet, luckily, you can directly watch 3D movies on your 3D tablet. As 3D movies download free from online sites, are you sure the movie downloaded is the real 3D movie or fake 3D movie? What does that mean? Let me tell you. The 3D movies on Internet are usually the 2D movies with post production like converting 2D films into 3D post-production. 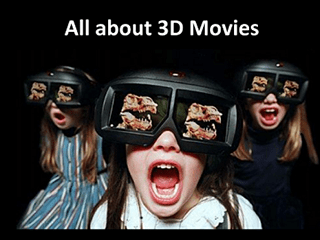 If the 3D movies are produced with qualified 3D effects, then the downloaded 3D movies will be played normally with so-called "3D-Experience". 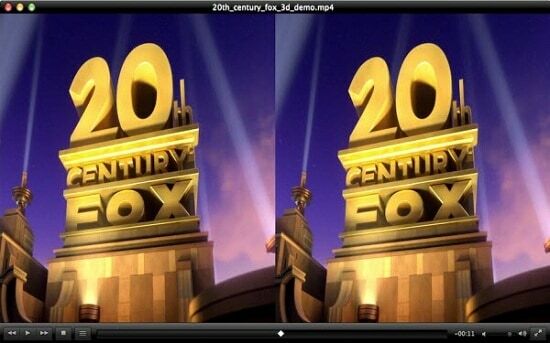 If unlucky, the 3D films downloaded might be playback with split screen (top/bottom or left/right Side by Side). You will be annoyed to watch 3D movies with 2 pictures. How to see 3D movie normally by turning split screen into one? Solution 1: Delete this fake 3D movie resource and download a real 3D movie and avoid the 3D SBS version from other 3D Blu-ray movie download sites. Solution 2: Download and install the best free 3D video player - VLC media player, which has the adjustment equipments for you to tackle 3D movie split screen issue: find out "Adjustments and Effects" in VLC > Tick "Video Effects" > Choose "Anaglyph 3D" > Done. Solution 3: Playback 3D movies on your 3D tablets or Samsung/LG 3D TV rather than the normal mobile device or computers. One - Downloaded 3D Movies Have the Same Effects with 3D Movies in Cinema? The answer is No, or Yes. First of all, why the answer is no. Let me explain. According to the explanation on realorfake3d, we can see that movies shot on 3D cameras are usually much more pleasing to watch than movies that were simply converted to 3D after-the-fact (including the 3D movies downloaded online). Secondly, why the answer is yes. See, though there are many Hollywood action movies shot on 3D cameras, the 3D movie quality varies from IMAX 3D movies, 3D blu ray movies, 3D movies Full HD 1080P, 4K 3D movies, etc. That's why we say movies are not actually "real" 3D after all. Two - 2D Movies or 3D Movies, Which One is Better? There's no denying that in today's film industry they're important both as a gimmick and as a way to introduce the audience in the story (take Avatar for instance). However it's undisputed that while the 3D works quite well for some action/animated movies, sometimes it's just no better than 2D movies. Recent research of 400 filmgoers conducted by California State University shows that 3D movies offers no measurable improvement in enjoyment for the vast majority of film audiences. Reasons lies in that high definition 3D movies lack the ability to let viewers experience more intense emotional reactions and is seemingly having no advantage over their 2D counterparts in terms of enhancing the ability to recall a film's details. Worse still, the long-time watching on 3D movies would result in eyestrain, headache or trouble with vision. Hence, it's advisable for you to properly manage your 3D movie watching frequency and time. After all, health is far more important than entertainment.